NEW! T·View version 5 is NOW available, providing the industry's only television planning system providing a planner-oriented reach/frequency system for everyday use capable of using Nielsen's All-Minute data, or Nielsen's Mid-Minute data, or the Nielsen Persons Cume Study. T·View 5 is completely respondent-based, giving a level of flexibility and precision never before seen in a television and online planning system. To master all of that new information, T·View 5 sports a powerful optimizer and a variety of unique analytical gizmos -- giving you powerful ways to make your plans even better! T·View is a state-of-the-art television and online planning, R&F and optimization system. T·View is fully "buzzword compliant" giving planners a single package that provides up-to-date reach solutions, with respondent-level data and a sophisticated optimization facility. 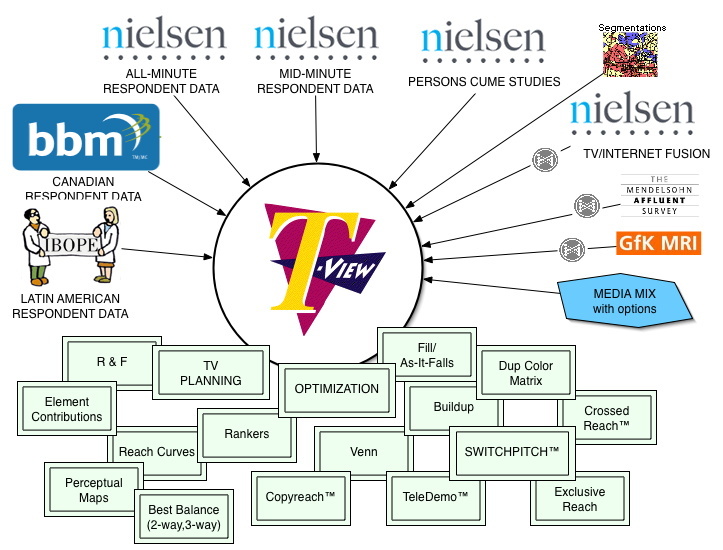 Long many planners' favorite television system, T·View is now an online planning system as well, incorporating Nielsen's online fusion data and its 80,000+ websites and ad networks. Anything that you can do with T-View for television planning and analysis, you can do for online as well. That includes all of the tools, reports and optimizers. In a single system with the same interface, T·View supports respondent-level analysis from any of several sources, including: the continuous Nielsen Mid-Minute data, Nielsen All-Minute data, Nielsen Local People Meter markets, the Nielsen Persons Cume Study, continuous BBM national Canadian data, and IBOPE Latin American data. It's easy to learn once, and then to use it for any of these! T·View applies its powerful and proven Optimize and Switchpitch engines to modern respondent-level television and online analysis. The analysis tools combine to give a new dimension to planning: planners can apply personal media preferences, and discover tips for what to do next. The planner thus takes an active and intelligent role in plan refinement. All of this is made available through a straightforward, attractive user interface. T·View expands your media toolkit with extensive support for fusion data, including 19,000+ product, demographic and psychographic items from Mediamark (MRI), as well as data from Mendelsohn, Spectra, Catalina and other sources. Study the strengths, weaknesses and potential for your plan among dayparts, networks, and other television groupings, looking into patterns of potentials and accumulations, and document your discoveries with clear presentation charts. Television results can be combined with entered results for other media right on the same document, providing mixed-media planning and R&F. A powerful yet very flexible duplication tool lets you explore combinations of dayparts, networks, program groups or media. T·View is used in offices nationwide of a number of leading advertising and media agencies and cable networks. For info, call us at (847)873-0599.